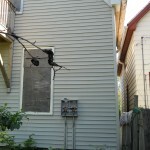 A last month on June 29th, 2011, a homeowner in Milwaukee needed the services of an electrical contractor. I was the master electrician and estimator that answered the telephone and also the one the visited the home to provide the free estimate. A customer called regarding his vacant duplex that was vandalized by predatory copper wire thieves. They often prey upon the poor and innocent trying their best to fend for themselves and survive independently from the need of government handouts. So what happened? What did the thieves do? They broke into the property of a retired man’s retirement project of fixing up an old vacant duplex with the hope to supplement his needs during his retirement. Don’t you like the man already? Here is what they did. The thieves climbed up a ladder, reached up to the connections made by the power company, WE Energies. The electrical connection height was 16’. The wires were cut at the top of the electrical service riser that was connected to the power company wires, they were hot at the time if the theft and since most people are very cautious around electrical wires, it was probably perpetrated by someone with some electrical experience. Once disconnected from the live feed from WE Energies, they pulled the service riser down off the outside rear wall and broke the conduit hub and meter socket and the terminal lugs inside the meter socket. This way they got three large copper conductors to scrap for pennies on the dollar. The criminals did not stop there. Next, they broke into the house at the front door because the rear door was boarded up for security reasons. The next stop was the basement; they stripped out the two electrical panels of half of the circuit breakers and all of the wire that was easily stolen. They did not stop there. They stole all of the copper wire they could steal by either pulling the wire out of the conduit or by stealing it with the conduit. The next theft was pulling out any copper wine in the basement conduit system, which was the majority of the wire in the basement feeding both the first and second floor tenants. The only wire left were six-inch lengths of wire from cables that were dropped down from the upper floors. I have been doing this work for 34 years and during that time, I have seen this predatory thievery repeatedly over the years. It is always amazing to me that neighbors who are often outside playing in the streets or walking down the sidewalk or just sitting on their porches never ever seem to see anything or anybody doing anything illegal to their neighbors properties. Hum, how does that happen? I am told fear plays major a role in it. Those same neighbors often have several kids that they would like to see come home at the end of the day, alive. Those same neighbors also want to make it home themselves or maybe avoid having their homes broken into and robbed. For the most part, Milwaukee is a great city and a great community but like any community, it has those that will prey upon the vulnerable. This entry was posted on Wednesday, July 27th, 2011 at 4:05 pm	and is filed under Uncategorized. You can follow any responses to this entry through the RSS 2.0 feed. You can skip to the end and leave a comment. Pinging is currently not allowed.